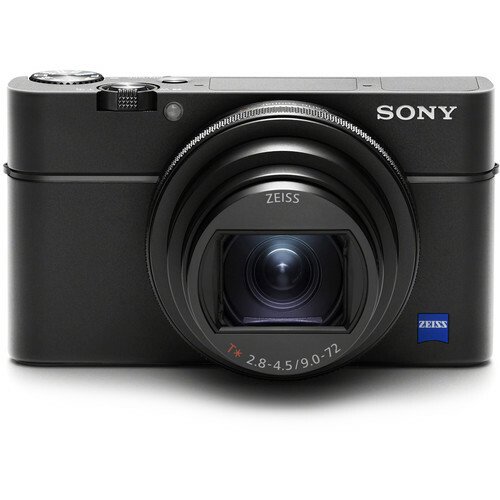 The new Sony Cyber-shot DSC-RX100 VI compact camera is now officially announced. Distinguished in the series by its extended zoom, the RX100 VI sports a 24-200mm-equivalent ZEISS Vario-Sonnar T* lens covering wide-angle to telephoto focal lengths for greater shooting flexibility. Leveraging the most from the updated lens design is the 20.1MP 1″ Exmor RS CMOS sensor, along with an improved BIONZ X image processor, for fast shooting performance to 24 fps, high sensitivity to ISO 12800, and UHD 4K video recording. The new Sony Cyber-shot RX100 VI compact camera will ship next month for $1,198 in the USA (£1,150 in the UK). In addition, Sony announced the VCT-SGR1 shooting grip, designed for the RX0 and RX100-series cameras. Ideal for vlogging, travel photography and video shooting, self-portraits and much more. The VCT-SGR1 includes camera controls, an adjustable head and built-in tripod. It will be available in September for $99.99. 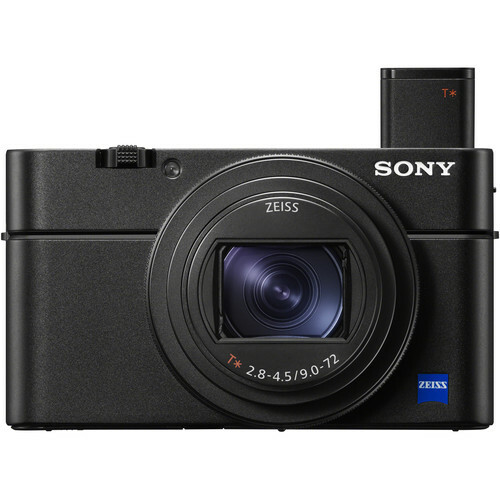 Sony RX100 VI: $1,198 at B&H, Adorama. Sony VCT-SGR1 Shooting Grip: $99.99 at B&H, Adorama. The innovative new RX100 VI camera is the first of all the RX100 models to include a high magnification zoom lens, as it packs in an impressive ZEISS® Vario-Sonnar T* 24-200mm F2.8 – F4.5 lens yet doesn’t sacrifice the pocket-size portability, fast responsiveness and high image quality that has become the hallmark of Sony’s RX100 lineup. It’s extensive zoom, impressive image quality and versatility for both still images and video make it an ideal choice for capturing daily life, cityscapes, portraiture, sports, wildlife and everything in between. The new model is equipped with a 20.1 MP 1.0-type stacked Exmor RS™ CMOS image sensor with DRAM chip and an upgraded BIONZ X™ image processing system with a front-end LSI that maximizes processing speed and optimizes image quality in all shooting environments. Additionally, the RX100 VI features an incredibly efficient Fast Hybrid AF system with 315-point phase-detection AF points on the sensor that can acquire focus in as little as 0.03 seconds, the world’s fastest AF acquisition time for 1.0-type sensor cameras. It can also shoot at up to 24 fps at full resolution with continuous AF/AE tracking and produces beautiful 4K video with full pixel readout and no pixel binning. A first for Sony’s RX100 series of cameras, the new ZEISS® Vario-Sonnar T* 24-200mm F2.8 – F4.5 lens packs the power of both 24-70mm and 70-200mm focal lengths into a singular compact design. This is achieved thanks to its unique design featuring two ED (extra-low dispersion) aspherical glass elements and eight aspherical lens elements including four AA (advanced aspherical) lenses. All pieces work together seamlessly to deliver outstanding sharpness from corner-to-corner at all focal lengths, maintaining the acclaimed image quality of the RX100 series. The impressive new lens on the RX100 VI maintains a large aperture throughout the entire zoom range, ensuring portraits can be created with beautiful background defocus, fast moving subjects can be captured with crisp focus and no blurring, and much more. Additionally, the lens has built-in Optical SteadyShotTM image stabilization that is equivalent to a 4.0-stopvifaster shutter speed, helping to prevent camera shake or blurry imageseven in a low-light condition or at telephoto zoom range. Additionally, a first for the RX100 series of cameras, the RX100 VI includes Sony’s advanced High-density Tracking AF technology, which concentrates AF points around a subject to improve tracking and focus accuracy. The popular Eye AF technology is also available with approximately 2x the tracking performance of the current RX100 series model[ix]. Further, the camera has LCD touch focusing and touchpad focus point control for users that would like to drag their fingers to ideal focus points of their choice. For the first time in a Cyber-shot camera, the RX100 VI features 4K HDR compatibility thanks to its new HLG (Hybrid Log-Gamma) picture profile that offers an instant HDR workflow solution. Additional professional caliber video features include S-Log3/S-Gamut3, 120p Full HD mode, Picture Profile, proxy recording and more. The RX100 VI is also able to record super slow motion video at either 240fps, 480 fps or 960 fps. The new RX100 VI is equipped with a high-contrast 2.35 million dot XGA OLED Tru-Finder™ with ZEISS®T* Coating, ensuring true-to-life image preview and playback functionality. The EVFitselfretracts in and out of the camera body based on user preference, and can be activated instantly by asingle One-push Access button. A first for Sony’s RX series, RX100 VI has a touch shutter that can be activated by tapping the back LCD screen, a zoom lever with customizable zoom speeds and an LCD that can be rotated 180 degrees upward or 90 degrees downward for a variety of shooting angles for the creator. There is also aMonitor Auto OFF function that boosts max number of still images by up to 30%, and the camera is also Wi-Fi®, NFC™ and Bluetooth® compatible.